It may have taken a while to reach us here in the UK, but following the announcement of the official roll-out of 4G LTE it looks like it shouldn’t be too long before we are reaping the benefits of faster mobile data services. While 4G LTE is an evolution of the existing 3G networks it offers a service, which boasts marked differences to 3G. Essentially, the speed at which a mobile device can communicate with its related network and download or upload data is increased to a level which could see the streaming of HD video and other data-loaded uses becoming much easier and swifter than what we’re currently used to. 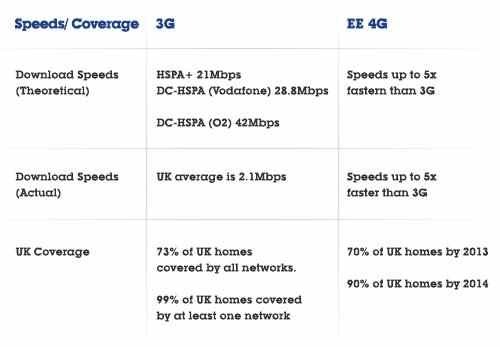 At the moment, most UK network coverage uses HSPA+, a standard of the technologies collectively known as 3G, but while on paper this is said to bring maximum download speeds of 21Mbps, in reality the UK average experienced by mobile users is just 2.1Mbps. On the other hand 4G is said to be capable of delivering data speeds of at least 100Mbps. And, while the new service won’t reach everyone over night it is expected to be available to 70% of the population by the end of 2013. Perhaps the main benefit of 4G is that it’s a completely data-based network which boasts a much larger bandwidth than 3G so more data can pass through at a quicker rate, leading to predictions that 4G speeds will be four to six times speedier than 3G. Once 4G has been fully rolled out and ‘finds its feet’ as it were, the data transfer speeds it’s capable of will reach levels, that a few years ago, would have been deemed almost impossible. We’ve compiled the rates at which current UK 3G networks perform and compared them to the service Everything Everywhere (EE) has confirmed will be available via its new 4G LTE network. It’s clear to see from the figures that there are huge number of advantages attached to 4G that will benefit various users; improving communications across businesses, helping the economy and even aiding those living in rural areas that would otherwise have little or no broadband at all. Over the last four years data volumes on mobile broadband have increased by 8,000% and with the introduction of 4G, by 2020 it is believed you’ll be able to download a feature film in just 10 minutes; 50 minutes quicker than it takes with current 3G speeds. And, if you want to download a full album, it’ll take one minute instead of five; so on the whole downloads will be 20 times faster than 3G. Despite only being launched a few weeks ago the future of 4G phones look set to transform the way we work, communicate and go about our everyday lives. It’s taken some time to arrive here in the UK and it’ll no doubt take a while longer for the service to extend out to everyone, but it seems that this forth-generation of mobile technology will propel the user experience to a level where sharing data will be faster than ever before. Written by Sarah Hazelwood of Phones 4u — the home of top smartphone contracts including the Samsung Galaxy Note 2 and iPhone 5 deals.